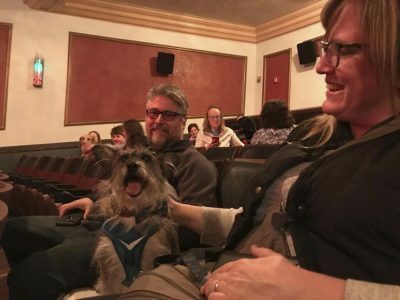 Dog barks erupted throughout Somerville Theatre Saturday as owners brought their pets to view Wes Anderson’s newest film “Isle of Dogs.” Whenever a dog on the screen barked, the dogs howled and owners quickly followed with resounding shushes. The showing celebrated the nationwide release of Anderson’s film on April 13. The event was organized in collaboration with the Massachusetts Society for the Prevention of Cruelty to Animals. The event’s proceeds went to the MSPCA at Nevins Farm’s Angels for Animals Fund, according to Julia Pesek, the community outreach coordinator for MSPCA at Nevins Farm. The fund provides necessary finances for animal medical emergencies brought to the MSPCA. The Nevins Farm MSPCA provides a variety of services, including animal behavior classes as well as spay and neuter programs for animals ranging from birds to horses. The theater charged owners a $10 admission fee and suggested attendees donate $5 to the MSPCA. The lobby was laid out with bowls of water for dogs who were thirsty and the shelter had a table covered with tennis balls and treats. Inside the theater, the movie played at a slightly lower volume than usual and the lights were dimmed to prevent overstimulating the dogs. 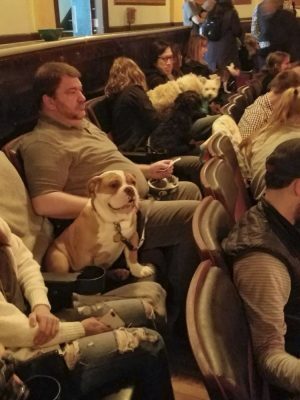 Dogs of every shape and size were in attendance, from a tiny French bulldog curled up in his owner’s lap to a Great Dane unintentionally blocking the aisle. One golden retriever sat quietly in his chair and watched the movie with great interest while other dogs looked happy just to be inside and resting with their owners. A few easily distracted dogs paced the aisle looking at all their new neighbors. 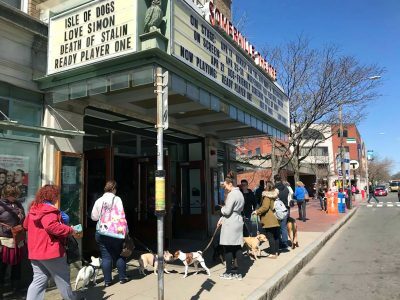 “We’re really trying to tie in the local environment from everybody else, its business and people from the area that really make it feel like your hometown theater,” said Jessica Going, a manager at Somerville Theatre and the coordinator for the “Aisle of Dogs” event. The theater partnered with several local stores and dog care services to give away coupons and other raffle prizes for the dogs and their owners attending the showing. The Somerville Theatre has been open since 1914 and is one of the many local movie theaters in the Greater Boston area. Ian Judge, director of operations for the theater, said there are challenges that come with operating a local movie theater, especially competing against big chains like AMC. Toward the end of the film, one dog escaped its leash and climbed onto the stage to get a closer view of the movie, but its owner quickly brought it back to its seat. After the showing ended, the street outside the theater was like a doggie networking event. 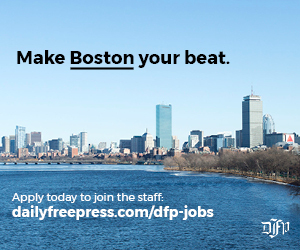 “I think everyone had fun,” said Mike Hanscom, a social worker from Springfield who was there with his French bulldog, Nino. Hanscom said Nino enjoyed the film and was very well-behaved through most of it, even sitting on his lap as he watched the movie. Alex Torres, of Chelsea, brought his dog Canela, a 10-year-old dachshund mix. The theater is planning on hosting more community events in the future, Judge said.